Form follows function. The oft-quoted, much misunderstood dictum associated with the Bauhaus finds few better expressions than the chess set designed by the workshop master Josef Hartwig in 1922, writes Alex Cameron. Developed from the elementary forms – triangle, square and circle – using stained limewood, Hartwig’s design is testimony to the beauty of economy and the power of human-centred design. 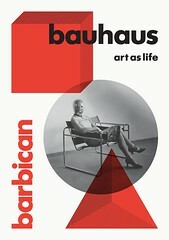 London visitors can see it at the Barbican from next Thursday (3 May 2012) as part of the exhibition Bauhaus: Art as Life. While he may not be one of the better-known figures of the School, Hartwig played an important role in reconstituting the basic craft training programmes at the Bauhaus – regarded as an ‘indispensible foundation for all artistic creation’ by its founder Walter Gropius. The significance of Hartwig’s appointment in 1921 as leader of the wood-carving and sculpture workshop was clear to his colleague and collaborator Joost Schmidt. 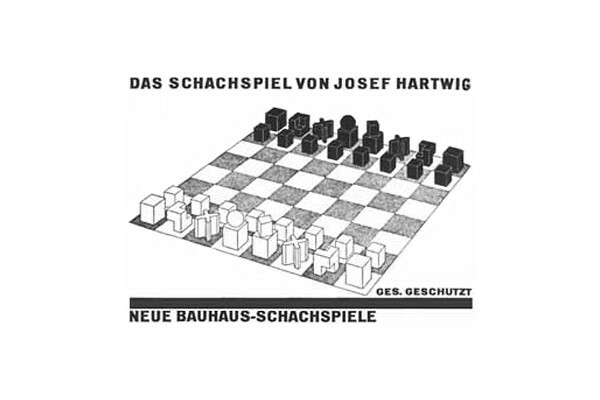 The designer of the advertising and packaging of the chess set, Schmidt later said that previously ‘everything was jumbled up in a murky chaos in which it was not yet possible to see what kind of “Bauhaus reality” would come out of it.’ One such ‘Bauhaus reality’ was the redesign of the chess piece. The figurative designs of most chess sets allude to the old world order of pre-capitalist societies and are often based on peculiar national characteristics – king and queen (originally a man, the ‘adviser to the king’), knight, bishop (the fool in France and standard bearer in Italy), rook and pawn (soldier, citizen). Hartwig’s abstract pieces represent the essence of the game by pointing to the unique method of moves they make on the chessboard. The square shape of the rook implies its movement back and forth, left and right. The bishop’s diagonal cross and the L-shaped faces of the knight suggest their respective moves, while the queen’s spherical head represents her ability to travel in any direction. 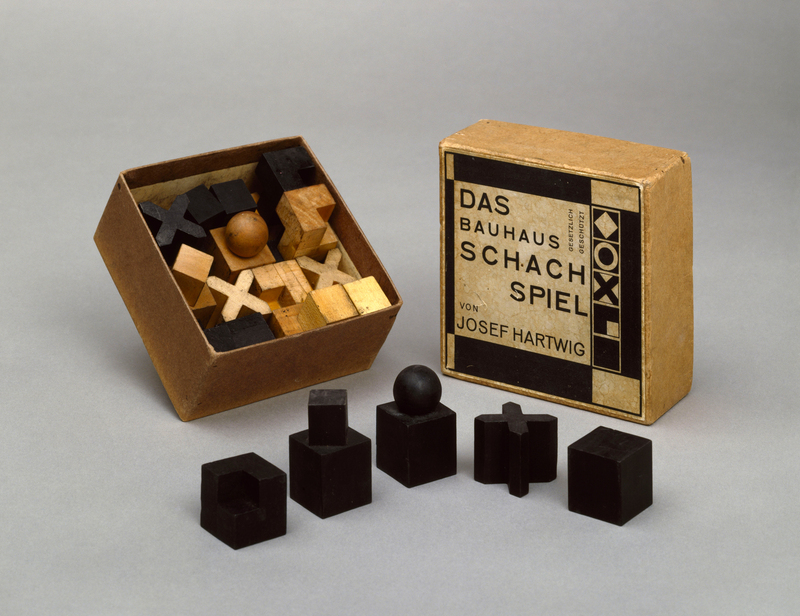 Like much of the design of the Modern Movement, Hartwig’s chess set championed a new set of standards for design based on technological innovation, economy of materials and aesthetics. 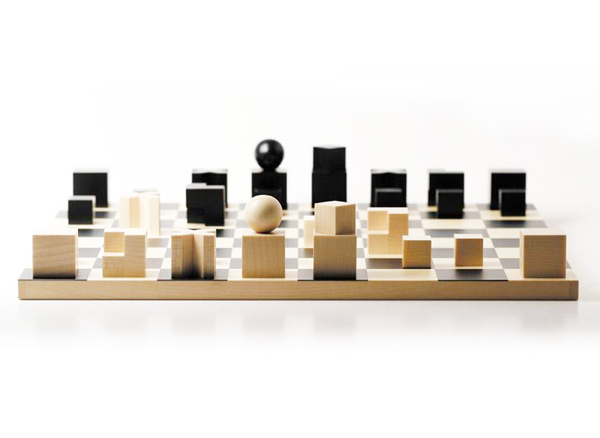 Hartwig’s chess set is a triumph of Modern design. Produced in co-operation with Bauhaus-Archiv Berlin / Museum für Gestaltung, Stiftung Bauhaus Dessau and Klassik Stiftung Weimar; co-curated by Barbican curators Catherine Ince and Lydia Yee; and designed by architects Carmody Groarke, working in collaboration with graphic designers A Practice For Everyday Life (APFEL).